Australian label printer Peacock Bros has installed HP Indigo 8000 Digital Press to expand its capacity. 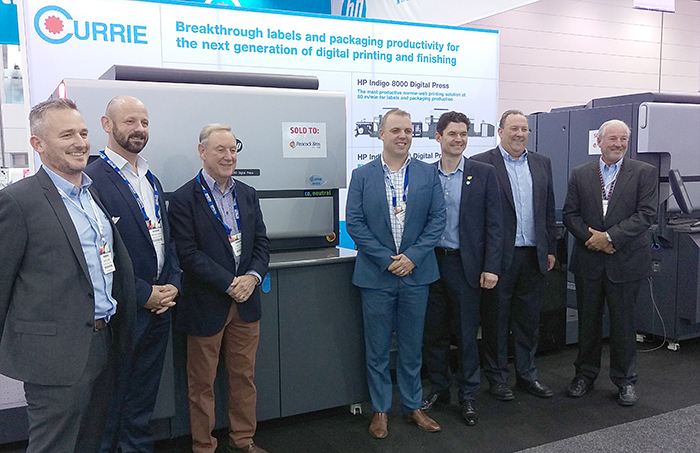 The HP Indigo 8000 Digital Press, which was recently showcased at PacPrint 2017, is claimed to be one of the best selling, narrow-web labels solution and it can work at speeds of up to 262 feet per minute. The machine's One Shot technology lets accurate and repeatable colour-to-colour registration, even on heat-sensitive materials. It supports a range of media in digital production which include synthetic and paper substrates from 12 to 450 microns. Some of HP Indigo’s prominent customers include companies such as Coca-Cola, Budweiser, P&G and Oreo. HP claims that due to its high print quality and flexible technology, these companies have been able to respond to market challenges and stay competitive. Established in 1888, Peacock Bros is a fifth-generation, family run business. The company now has about 100 employees and operates from its head office in Melbourne and in Sydney, Brisbane, Perth, Adelaide and New Zealand. Image: Peacock Bros installs HP Indigo 8000 Digital Press. Photo: Courtesy of Peacock Bros. Pty Ltd.